Following swiftly on (for me!) from my Open Studios post, I thought I'd post some photos of my very small and select rag rug collection! Here you see my Primitive Vase rug, which I started years ago with Yvonne. I'd like to say I have finished it but to be honest it isn't bound, just sits on the floor in my sewing room. But I do love it, warts and all. I 'designed' it myself (ah you'd guessed that, hadn't you?) and it incorporates many of my quilting favourites - stripes, triangles, and naive flower pots. On to something a little more professionally finished! This is the lovely sunflower cushion I brought away from Sally-Ann's Open Studio on Thursday. It fits beautifully against a small quilt on my wicker chair in the living room. Love it! Not quite in the same class - my unfinished Bird seat cushion. Erm, yes, it is a bird, honest! I'm a bit cross with myself as I packed the wing and feet too tightly; the fabric is multi-coloured and I thought it might work but I think it perhaps doesn't. Oh dear. Perhaps I should get down to a spot of 'frogging', it's only going to bother me. (Frogging, so-called because the sound of swift un-picking is like 'ribbit ribbit') Yes, Lynne, come on, do it, you know it makes sense. Close-up. No, that multi-coloured fabric doesn't work, does it? Out it comes. Sigh. This is better! 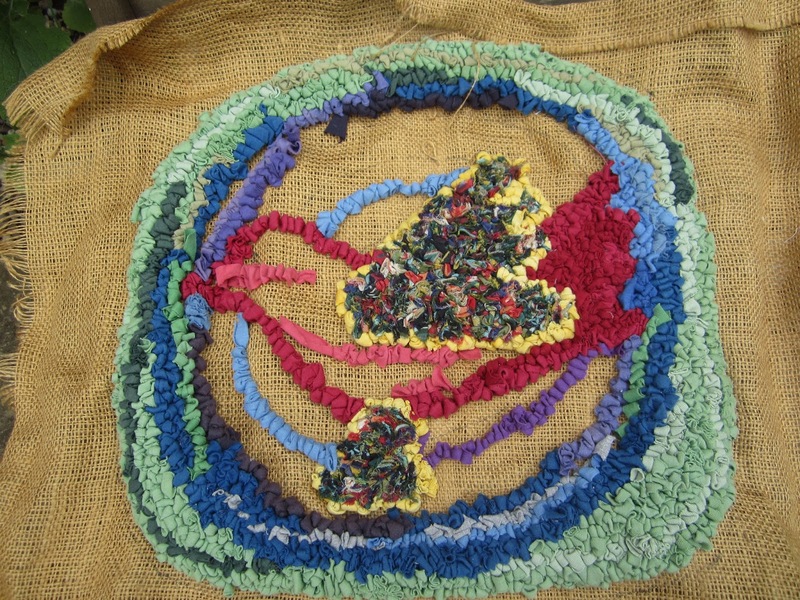 The tulip rug I purchased from Sally-Ann at Open Studios 2011. This sits on the floor before the kitchen sink, so it gets well worn; you can see it has faded a little, but it washes well - we just chuck it in the machine and out it comes sparkling clean and no unravelling. Here you can see Sally-Ann's clever use of colour mixing for a variegated effect. Love it! And to finish up another peek at my Primitive Vase, laid flat on the garden table. You can see the colours a little more clearly. I'm still quite chuffed with this, I must say. Thanks to Yvonne, I hope to be tootling along to a rag rug group later this year, so perhaps some of the undoubted expertise might rub off on me while I'm there! I live in hope! Happy Weekends to you. I love the look of those, very nice. I do mine using a locker hook and canvas. Unfortunately don't think they can be washed in the machine as the first rug I made and did this too (even on a gentle wool wash), lost half of its material. I must admit, I always edge mine first as I just know if I don't, I'll never do it. I must admit, I have been wondering if they could be made using heavy duty small holed bird netting (the kind that can be cut to shape rather than the floppy stuff). Hi Dc. I think you could probably make use of ANYTHING with a mesh formation. And yes, you are right, edging at the beginning is the way to do it. With your locker hook do you use wool (yarn) or do you use rags as in rag rugs? I have an old implement which I think is a locker hook, but have never used it. I use as strong a yarn as I can, the sort that needs cutting rather than breaking. A locker hook looks like a fat crochet hook, with a hook at one end and an eye for threading at the other end. Hmm, the tool I have has a wooden handle, a hook at t'other end,and just below the hook is a mobile pointy thing - like a tiny dagger!It flips up and down and I can't for the life of me see how it functions! I have also found another implement, wooden handle long pointed shaft like a bay one, and on the underside is a spring-loaded clip, which,if you press it, opens the bottom of the bayonet tip like a bird's beak opening, which reveals the tip to have a tiny hook on it! Sorry, not very clear, am I? Aha! I searched red Aldous on-line, under Rug Making, and it is called a Rag Rugger! That's all. There's a photo, the catalogue number is SKU 5153, I think it might even be the first page of implements, or second. Mine doesn't have two wooden handles but in all other respects it is the same tool. Phew, so glad to get THAT sorted! Never tried rag rugs but my son is having a go . I don't think his has a pattern at all. I love your vase. They're all so colourful! This is something I've never tried and I really must! You must, Annie! And photographic evidence, please!! Hi Connie. Thanks for popping by. Yes, it is time consuming, which is why I don't do as much as I'd like to. My friend Yvonne is the one you'd be wanting to visit for a lesson - she got me started and makes amazing rugs herself. I love your rag rugs, There were some lovely ones for sale in the galleries in Cornwall last year at prices beyond my pocket (of course they were worth it) Perhaps I should try and make one myself!!! Sue, it isn't a difficult thing to do, I just need company when I hook, for some reason! And I love it that you can trace a design, or do one yourself which can be as naive as you like - as you can see! Or just lines, or boxes - easy. I can give you my friend Yvonne's name she teaches one to one at her home. But perhaps North Creake is a long way for you to travel. Any way, you can google Yvonne Autie and will find her details.